A few months ago, I got wind of a Boston cocktail competition called Movers & Shakers, and I thought it would make for an interesting blog post. But I couldn’t make it. Last Friday, the local Bully Boy Distillers held a speakeasy party to celebrate their first anniversary. That sounded like a cool event and the basis of a good story. But I was previously engaged and could not attend. I was honored to be invited to the Marie Brizard USA Cocktail Challenge Boston Semifinal this past Monday. The winner would have the chance to compete for a national title in New Orleans. Which local mixologist won? I don’t know…because the competition was during work hours and I couldn’t go. And that’s when a chance at redemption presented itself via my Twitter feed. 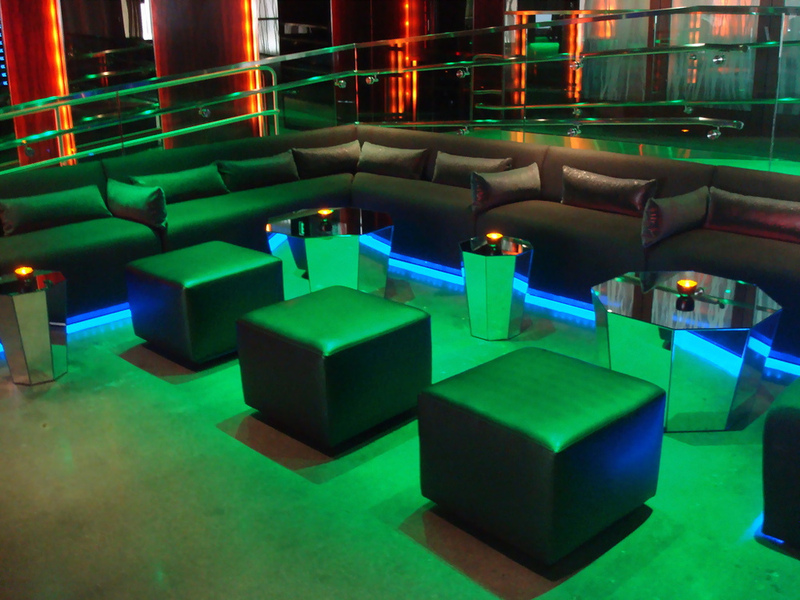 Emerald, a sleek new bar in the Theater District’s recently opened Revere Hotel, was hosting a social media event in advance of its public debut…and I was not going to pass this up. I was short on time – had to pack for a trip to Florida – so my visit was brief, and this post will in no way do Emerald justice. But it’s probably a good thing I had a commitment – otherwise I think I would have tried every intriguing cocktail on the menu and ended up paying for a room upstairs. Walking into this upscale cocktail lounge, you might be forgiven for momentarily thinking you’d just been swept away to a land beyond the rainbow. Which makes sense – Emerald’s theme is based on the Wizard of Oz. You definitely won’t feel like you’re in Boston anymore – I’ve never seen a bar like this, here or anywhere else. This place is absolutely beautiful. It’s a large, spacious cocktail lounge with two bars on two floors. The bar on the lower level seats about 15, and there’s a central area with comfortable couches and lounge-type seating. True to its name, Emerald is illuminated mostly by emerald green lighting, with splashes of red here and there. Large mirrors on the walls and cool mirrored tables reflect the colors and give the space incredible depth. 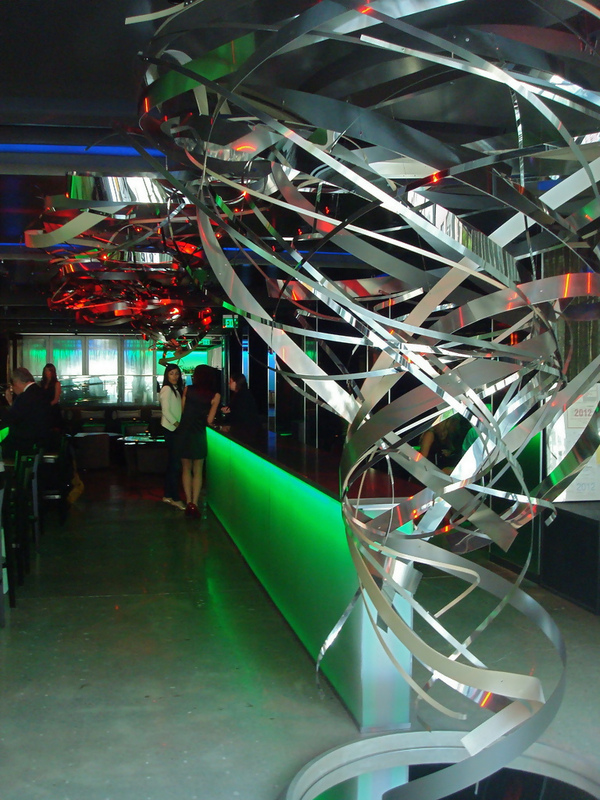 Modern sculptures of tornadoes contribute to an already fascinating décor, and while they aren’t exactly ruby slippers, waitresses sport red high heels. The drink menu is divided into two sections – Craft Cocktails and Wicked Libations. Tyrese, the bartender who took great care of me, told me that the Craft Cocktails were designed by Emerald’s bartenders over the course of several months and vetted by “corporate.” These are original cocktails or highly innovative twists on classics. The Wicked Libations are your standards – Manhattans, Mojitos, Cosmos, things of that nature, but with some modest customizations. Already feeling like I was in Oz, I had to start with the Emerald Punch – Stoli Orange vodka, Hennessey VS Cognac, Blue Curacao, ginger beer, orange juice, simple syrup, and if that wasn’t already over the top…fresh grated ginger. I could drink this baby all night (and at some point would imagine I saw flying monkeys). The coloring would lead you to think that all sorts of overly sugary liqueurs were thrown in to make it green, but the cocktail was nicely balanced and just sweet enough. And it did taste like punch, but a mature, refined punch. Next up was the Boston Shandy – Buffalo Trace whiskey, honey syrup, apple cider, and Shipyard Export, topped with a shaved apple chip that had been dried for two days and cured slightly with brown sugar. They could have just given me the apple chip and I probably would’ve been content. But what a blend of ingredients! The sweetness of the honey and the cider worked surprisingly well with the whiskey. Watching Tyrese whip up his concoctions was an experience. A cocktail wizard, he was obviously excited about the drinks he was making, and about the bar itself. In fact, there was a palpable sense of enthusiasm from the entire staff. It seems like they’ve been waiting for this day for a long time. And why wouldn’t they? This place looks phenomenal, and with its unique theme, Emerald will undoubtedly attract a curious crowd. Fortunately, this place offers much more than just a clever motif. Emerald joins a distinguished group of Boston bars that offer well-conceived, inventive cocktails. It will be an excellent late-night destination with friends when you want a fancier evening while maintaining a degree of intimacy. As thrilled as I was to be here, I had to make my visit a short one. But I will most certainly return, because Emerald deserves a much more detailed post. I’ve only tried a couple of the specialty cocktails, and there’s a mouthwatering menu of small plates to complement those exquisite drinks. I’m also dying to see this place later in the evening, when the lights are low and the green glow permeates the whole space. Until then, I’m off to the Florida Keys for a much-needed long weekend (because, you know, Memorial Day weekend was just so long ago). Hopefully I’ll have a colorful, tropical-themed post for you when I get back, with some semi-coherent Facebook updates and tweets in the meantime.